Popularly known as Mr. VD Agarwal is born & bought up in Agra, he has done his Masters degree in Mathematics in 1973 & Completed his PhD in environment Studies. Dr. V.D. Agarwal is a multi-faced with versatile personality. He is A prominent Realtor & a social worker. Dr. V.D. Agarwal has started his journey in constructions business way back 1986 when he has lay down the foundation of PCPL (Pushpanjali constructions Private Limited) & started his first project, at Saket Colony Agra. Starting his journey from there he has never look back, crossing all the hurdles laying one mile stone after another he has reached to this platform. Till date PCPL has added 104 Residential & commercial projects in there kitty. His journey was not a simple as we might be thinking off, it was full of challenges, problems & hurdles but he has made it possible with his strong willpower, focused approach, clear vision, continuously, tirelessly working …..Working hard towards his goal. Mr. Agarwal is not only just a realtor working with concrete, he is a thinker, always thinking to uplift the standard of the society, always extending his support & help to the deprived & under privileged people of the society. Associated with the organization called "Respect age International" which works for the betterment of senior citizen in the form of are & Rehabilitation, he is president of the association since past 8 yrs & played a pivot role in the construction of OLD AGE HOME for them. He was also awarded " Udyog Rattan" award in year 2006 received the Governor of the state. General Secretary of Agarsen seva Samiti, he has played a very important role in the construction of Agarsen Bhawan at Lohamandi Agra. 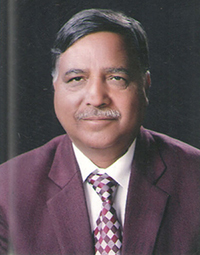 Dr. Agarwal is the active member of Rotary club Agra. He was also a president of Moon Olympics in year 2006. He has always been helpful to poor & needy people with bodily, soul, & financially. He has always extended his support & help to the people of all segments caste & religion. His love towards education is not hidden from the people; he was worked very hard to uplift the education standard of Agra & surrounding. Mr. Agarwal is always involved with education institutes directly- President of Agersen Shiksha Samiti, Agersen Kanya Maha Vidhalaya Kagarol. Dr. Agarwal is a member of Redco (Real estate developer & construction) & Ex Vice President. Ready to Move Studio/1/2 BHK Apartment. Assured 5% rental on ready to move 1/2 BHK Villa. Pickup and drop facility from Pushpanjali Baikunth to Iskcon temple. Possession has been given to more than 200 families. Copyright © 2017 - Pushpanjali Constructions. All rights reserved.